With just a few months into the fall quarter, a CSUSB freshman shared what it feels like to be a college student now. Beginning a new chapter into their lives can be tough for some people, whereas others enjoy the new start of a journey. Freshman and business major, Idalia Lorenzo-Gonzalez, shared what it’s like to make the adjustment from high school to college. AVID is a program that is offered in many middle and high schools that help younger students prepare themselves for college and what to expect when they start their first year. One of the top complications that students face that don’t live on campus is commuting from their home to the university. When it comes to commuting for the first time, it has its pros and cons. She currently commutes from Moreno Valley and spends about 35 minutes, without traffic, on the road to CSUSB. A few downsides to commuting, that she shared, is the money spent on gas, planning the day, and having to always leave an hour before just in case of traffic. “I have to plan out the whole day before I get out the door, and if I have any appointments on campus, I have to decide when I must leave my house to make it on time,” said Lorenzo-Gonzalez. During the first week of the fall quarter, freshmen are sometimes in a tough position when finding the building where their class will take place. For Lorenzo-Gonzalez, what helped her out greatly was the map of the campus that she had in hand. She considered the map her friend throughout the first days of this quarter. Idalia Lorenzo-Gonzalez working hard on her assignments for the week. When it comes to comparing college and high school, classes and studying are completely different for her. She finds solving math problems and reading a book early in the mornings a hassle. Lorenzo-Gonzalez has classes everyday, except on Fridays, and spends her time studying afterward. “Literally, I spend most of my time studying, doing homework and keep myself up-to-date on what to do,” said Lorenzo-Gonzalez. When living at home with the family, there are various distractions that can take students off track in their studies. 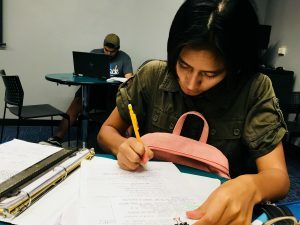 For her, she finds the bay, located at the Santos Manuel Student Union, to be her favorite spot to do her studies because of the calm atmosphere. Many majors have their own department of peer advisors that can help anyone when choosing what courses to take. Peer advisors also help out by checking if the student is on track to graduate. Despite just being in university for a few weeks, she has high hopes for her future and encourages other freshmen to keep their heads up.